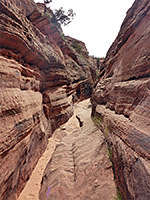 Only two official paths lead to viewpoints of the short, intact section of Glen Canyon downstream of the dam; the easy, popular Horseshoe Bend Trail and the steep, less well-known Spencer Trail near Lees Ferry, though several tributaries provide other routes to the Colorado River, such as Water Holes Canyon on the east side and Ferry Swale Canyon to the west. 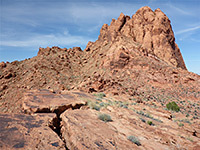 Another very rarely explored tributary is Fall Creek, also on the east side, on the Navajo reservation; this crosses partly sandy, partly rocky land, then drops off vertically by 600 feet as it approaches the Colorado, a feature known as Echo Peaks Fall on account of the red sandstone summits just beyond. 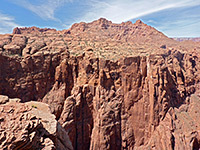 The peaks are the northernmost section of the lengthy Echo Cliffs which border the Colorado River valley for many miles south, and they are crossed by an almost completely disused hiking route, the Echo Pass Trail, linking US 89 on the plateau east of the cliffs with ALT US 89 to the west, near Navajo Bridge at the start of Marble Canyon. The loop hike described below is along part of the eastern section of this route then beside Fall Creek to the big drop-off at the edge of Glen Canyon, returning up the sometimes narrow streambed to the point where it is crossed by the old trail, and following the path westwards over several ravines and ridges, up to Echo Pass, which has spectacular views south over Marble Canyon. The loop is completed by returning along the path to Fall Creek, heading further up the drainage to a short, slot like tributary, and finally walking back to the start point - a round trip of 11 miles, initially descending by 1,000 feet but then relatively level. The route is either along the old trail - which although partially cairned is difficult to follow in places, while generally still in good condition - or cross country, mostly over rocks or firm sand. 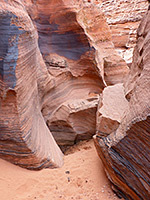 All the area is covered by the familiar red/orange Navajo sandstone, and the land has limited vegetation, mostly cacti and scattered spiky bushes. Glen Canyon area map, Echo Peas/Fall Creek topographic map. 23 views of Fall Creek and Echo Pass. Panorama from Echo Pass. Full screen version (16 mb). Start point for the hike is at a wide, flat pull-out on the west side of US 89, on top of a little hill, 13 miles south of Glen Canyon Dam. All the surrounding land is on the Navajo Reservation and hence a permit is required, at a cost of $5, purchased from the Leche-E Chapter House along Copper Mine Road. 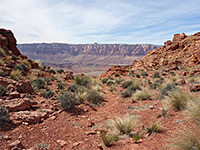 After climbing the fence beside the highway, a short walk northwards reaches the edge of the plateau; ahead, the land falls away quite steeply, revealing various features including the shallow drainage of Fall Creek to the northwest, with the Echo Peaks rising behind, and the rim of Glen Canyon in the distance, four miles away and about 1,000 feet lower. 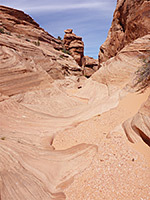 Extensive slickrock borders the creek, and extends beyond, while to the east, the land is mostly sandy, and level. The descent from the plateau is easy enough, through some briefly steep sections towards the top then over gradually lessening slopes, which are crossed by little cliffs, benches, and shallow drainages. The predominantly rocky hillside gives way to low, sandy mounds as the ground levels out, after about one mile. The next two miles are over the sands, heading due north, perhaps intersecting the disused track that forms the eastern section of the old route to Echo Pass, and following this to the vicinity of a seasonal pond where the track seems to fade away, though it used to curve west, and descend into the middle part of Fall Creek. From here it is another mile of easy walking northwards, aiming for the far end of the creek, as the land becomes a little rockier once more. The best views of the end of the drainage, and the 600 foot drop of Echo Peaks Fall are from a promontory a few hundred feet beyond, on the east side; from here a good part of the Colorado River in Glen Canyon is in view, as far as the banded Chinle hills near Lees Ferry. The end of Fall Creek forms a short, enclosed slot but is otherwise fairly shallow, and easy to enter by walking back upstream a short distance. 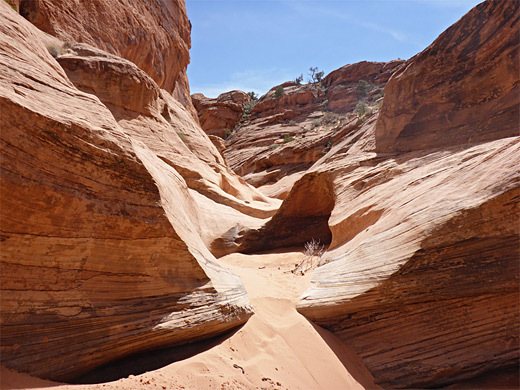 Around here are some short, moderately narrow passages through stripy, thin-layered sandstone, but further upstream the wash soon becomes wider and shallow, the floor mostly soft sand. The canyon bends slightly to the west, 0.8 miles from the fall, just after the old track/trail joins from the east. After a brief enclosed section between tall cliffs, a straight, northwest-trending tributary provides a course for the continuation of the trail - cairns mark a faint but recognizable path which climbs 300 feet to a saddle, traverses flattish land, passes over a minor ridge and comes down to a shallow ravine, then rounds a corner to the brink of a deeper canyon. All around are boulders, gullies and cliffs, uniformly colored red/orange, extending up to the Echo Peaks, now clearly visible a little way north. 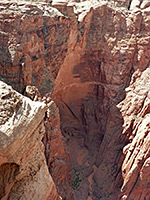 The path descends a narrow ledge along the south side of the canyon as it becomes shallower, then crosses the streambed and rises a shorter distance up the far side, curves round a hill and continues a few hundred feet to Echo Pass, near which is a fine overlook, on a flat, projecting sandstone slab. From here the views span a huge distance, across the Colorado River canyon to the Kaibab Plateau, along many miles of the Vermillion and Echo Cliffs and to the closer land around Navajo Bridge. The course of the continuation of the trail is visible below in places, as it takes a rather convoluted route steeply down the cliffs, continuing to an alternative trailhead along a dirt track that leaves ALT US 89 1.4 miles from the bridge. After descending the trail back to Fall Creek, the return route can either be directly up the far side to connect with the disused track, or further up the streambed - to the south, the creek gains height gradually, in part via three small but significant dryfalls, one needing a short bypass climb on the right side, followed by a wider passageway that leads to a fork in the canyon. The west branch soon enters a pretty but shallow slot, which ends prematurely at a tall, narrow concrete dam. The main fork remains quite shallow and it is easy to climb the east side and then head cross country to the start point along US 89, about 2.4 miles distant.